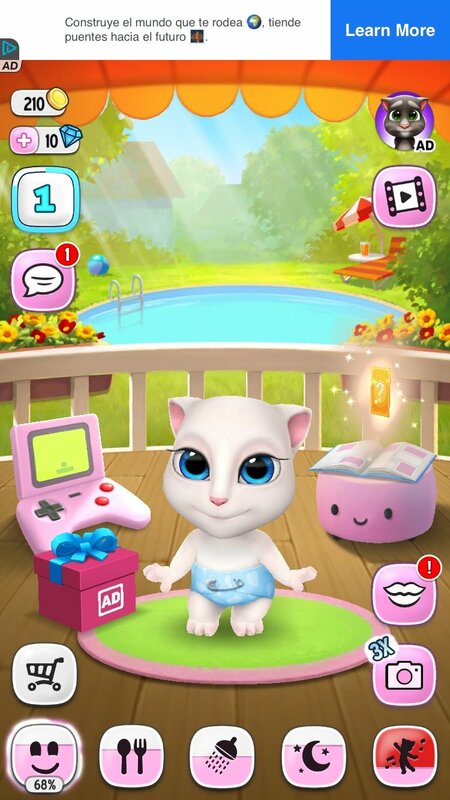 Virtual pet games are always popular and trendy, but especially since the proliferation of smartphone and tablets. Before the appearance of mobile platforms of the likes of Android and iPhone, tiny devices called Tamagotchis were already the rage among kids and adults. 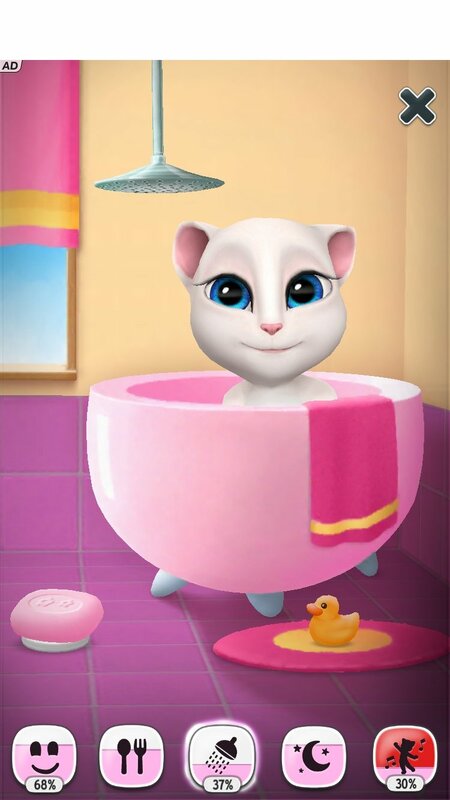 But now we've also got a wide range of applications to choose from, including Pou, Talking Tom Cat, My Talking Tom and this My Talking Angela, also developed by the game studio Outfit 7. 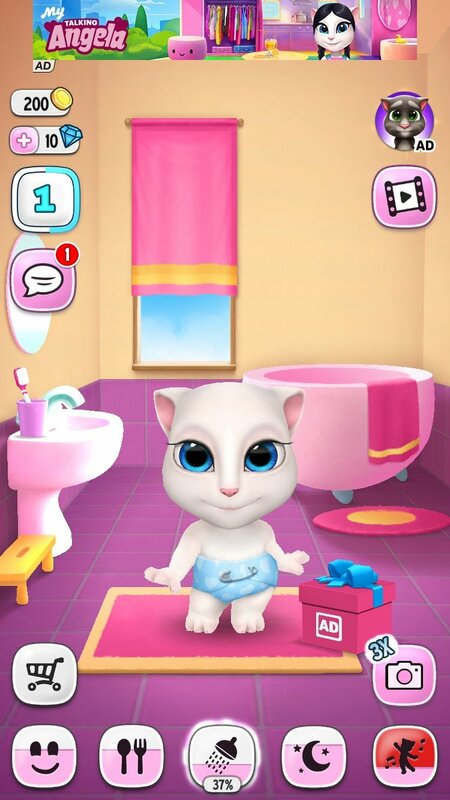 What is My Talking Angela? Well, it's basically an application for iOS devices in which have to adopt and take care of a female cat called Angela whom we have to give all the care she needs because she's not any old feline but a cat with plenty of style and that needs cuddles and caresses. Customize her clothes, makeup, and hairstyle. Take her shopping around town. Feed her and then teach her to clean her teeth. Sing her songs, stroke her and give her sweets. Play the different mini-games included in the application. Throughout the video game, you'll be able to take part in different challenges to get hold of rewards, and that's why plenty of users are constantly searching how to get hold of unlimited coins and diamonds. There are a few cheats for this purpose, as you'll be able to find out in certain Internet forums. You can also try out with SB Game Hacker if you've applied a jailbreak to your iPhone, as it will allow you to modify values of the game. But remember: that's cheating. 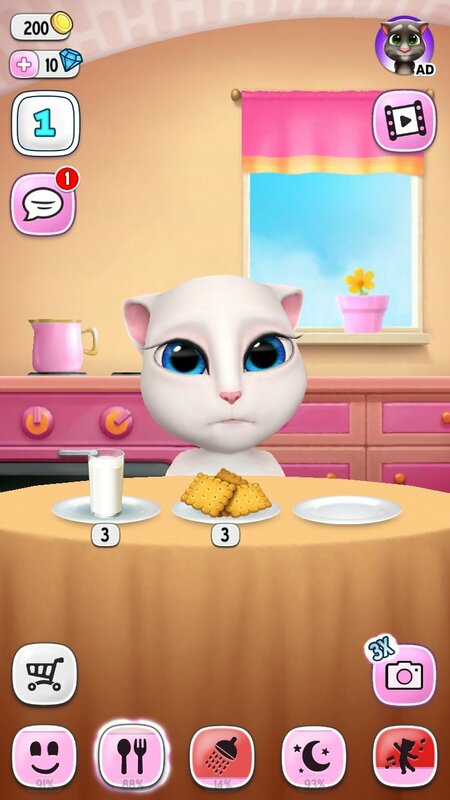 It's yet another app within the game saga based on Talking Tom Cat. Leaving virtual pet apps to one side (which also include the talking dog, Ben), we also have to mention And Friends or the endless runner Gold Run. They've all been great hits on smartphones, inspiring their users to download the Android APK to be able to play them on the desktop of their PC or Mac by means of an emulator. And some of the applications that have resulted from this success are fake versions... in some of which we can even find a pregnant Angela. A controversial app: what do Angela's eyes hide? What's so bad about the game? Rather than talking about controversy we should talk about unfounded rumors that have led many people to thank to that it's a bad game for kids and that a hacker could be behind it spying on the kids that use it with very reproachable intentions. Certain Internet forums even pointed out that it was a dangerous app, associated with several cases of missing children and pedophilia, and some people even said that somebody could be watching on its users through Angela's eyes. Don't worry, there's no spy camera hidden in Angela's eyes and it's not a dangerous game. 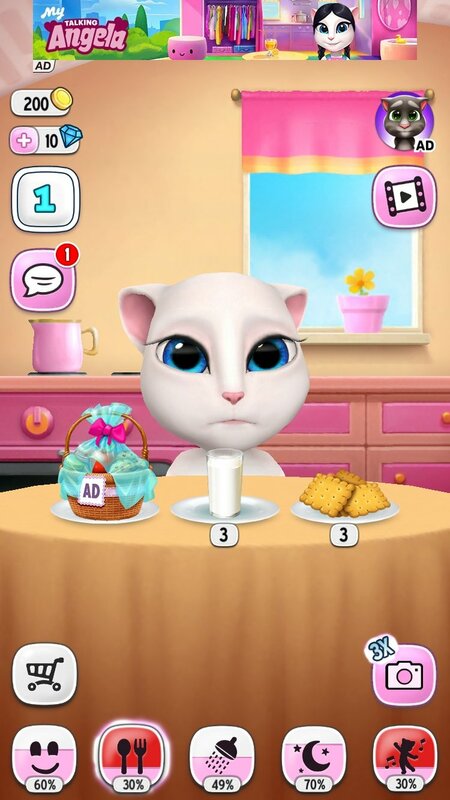 But the truth is that this application is totally safe and very appropriate for kids of all ages for them to learn the responsibilities necessary to look after real-life animals and pets, and in which they talk to a chatbot equipped with artificial intelligence, not a human being with awful intentions. New dance studio to dance with Angela.